Gold Looks Mostly Neutral in the Short-Term; Bearish Medium-Term Outlook to be Challenged? 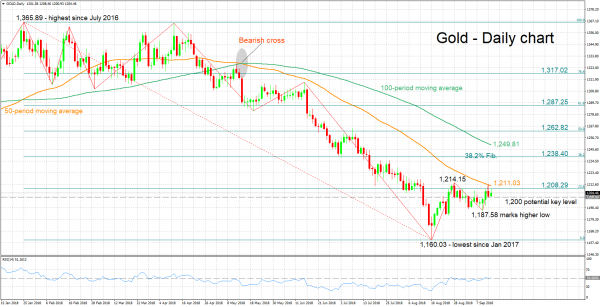 Gold has been moving within a relatively narrow range between 1,187.58 and 1,214.15 from late August onwards. The RSI is hovering around the 50 neutral-perceived level, pointing to the absence of momentum in either direction in the short-term. On the upside, immediate resistance to gains may come around the 23.6% Fibonacci retracement level of the downleg from 1,365.89 to 1,160.03 at 1,208.29. In proximity to this point are the current level of the 50-day moving average line at 1,211.03, Thursday’s two-week high of 1,212.54, as well as another peak from the recent past at 1,214.15, which also constitutes the upper bound of the previously mentioned trading range. Stronger gains would shift the attention to the 38.2% Fibonacci mark at 1,238.40. Should the precious metal head lower, initial support could occur the 1.200 round figure. Further below, the zone around 1,1187.58, the commodity’s lowest since August 24, may provide additional support. Lower still, 1,160.03, a more than a one-and-a-half-year nadir recorded around mid-August, would come into scope. The medium-term outlook looks predominantly bearish, with the 50- and 100-day MA lines maintaining a negative slope. Notice though that gold posted a higher low on Tuesday in contrast to the downtrend condition of lower highs and lower lows that was previously in place. Should price action also exceed 1,214.15 for a higher high, then the negative medium-term structure would increasingly come under question. Overall, the near-term bias appears neutral, while the medium-term picture continues to look mostly bearish at the moment. For the record, the yellow metal lost 11.8% after touching its highest since July 2016 in late January and is trading lower by 7.5% year-to-date.